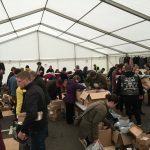 Dr. Martens held a closed sale for Staff and Friends back in April to turn their end of line stock and unused samples into donations they could give to their chosen charities. Members of the Wollaston Factory Team pitched in with forklifts and trolleys in the car park and unloaded 15 pallets of merchandise. 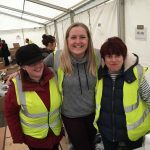 While Dr. Martens staff from all over the UK volunteered to work the event. Their target was to raise enough funds to reach the target they had set for a donation after costs and VAT were paid. Starting at 6am in far from summery conditions they laid out the products and had a queue right up the high street by 7am. Even the Staff who spend their working lives surrounded by the product and their families and friends know a bargain when they see one. The tent was full from 1 hour before the advertised opening time and for the rest of the sale. £10 a pair for boots or shoes and a broad range of T-Shirts, bags and accessories flew out of the tent by the arm load. Almost all the product was exchanged for donations and the target was hit by midday. After a clean up operation and a trip to the bank it was calculated that the team had raised enough to pay for the marquee, the teams breakfast and pay the tax man his cut of the takings. Dr. Martens Culture Team were delighted to present Footwear Friends with a cheque for £10,000 in the days after the sale.